Does SPOGS Racing offer the exciting racing experience that WiiWare is lacking so far? 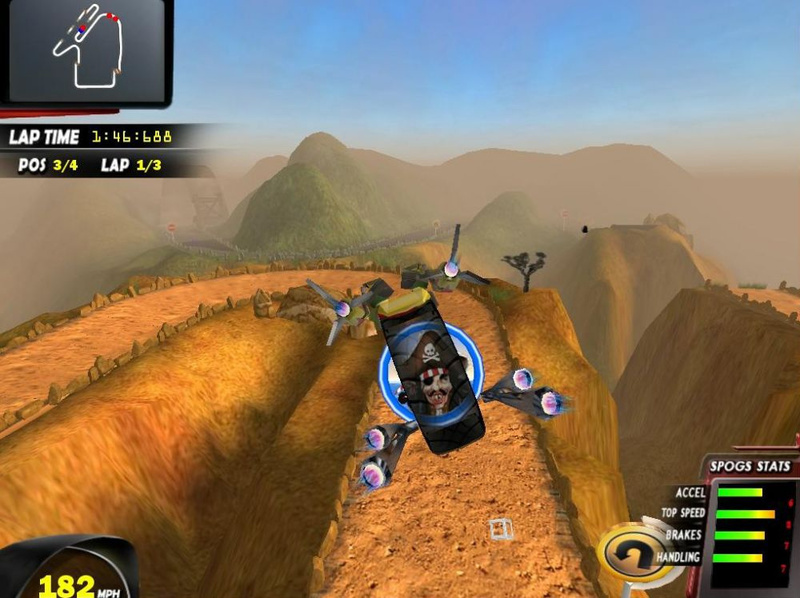 Coming at you full throttle is SPOGS Racing, an all-new racer featuring classic arcade racing, pick-up-and-play controls, all-new racing vehicles and Crash N’ Grab battling action. 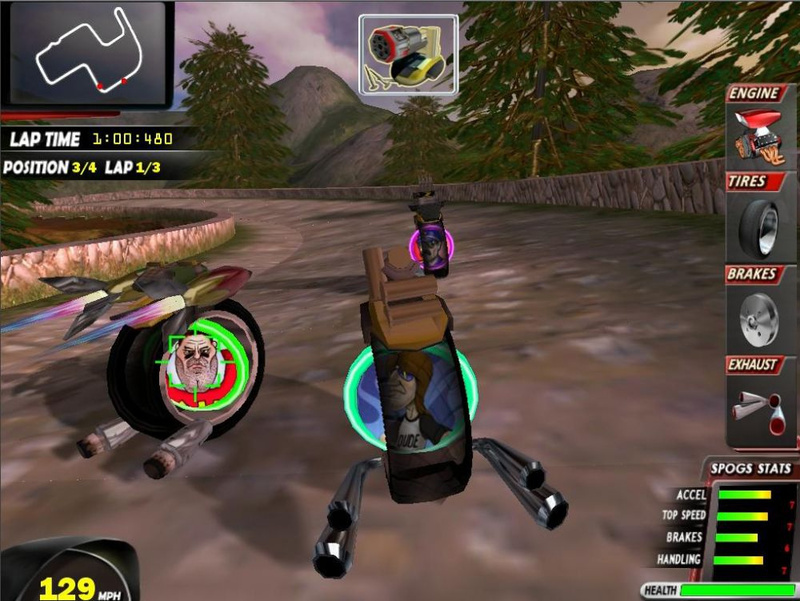 Jump in, gear up and modify your ride as you compete head-to-head for a totally outrageous arcade racing experience. 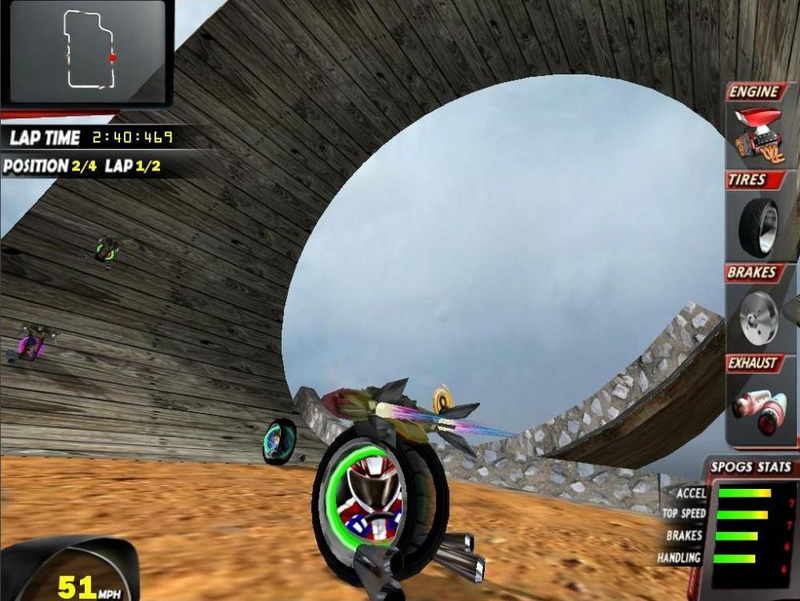 Race along in unique SPOGS Racers that can be personalized, customized and modified with unique images and vehicle parts. 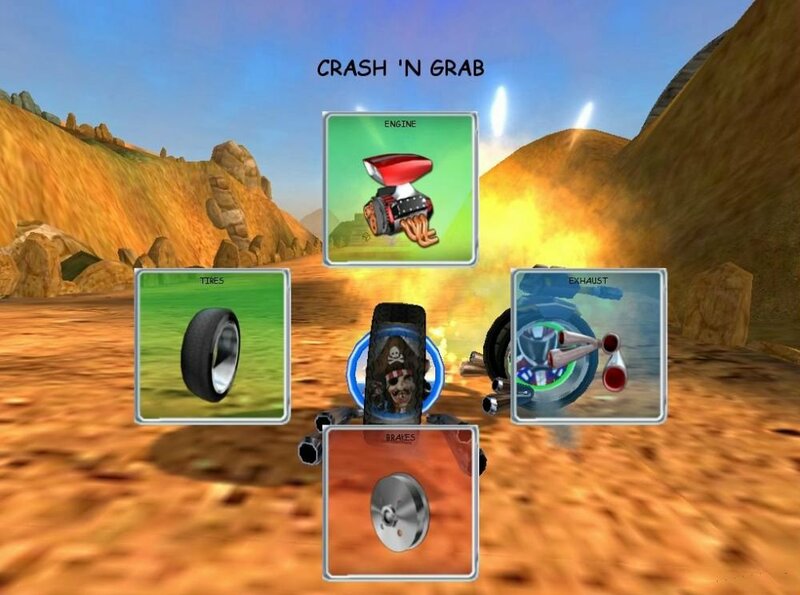 Crash ‘N Grab battling action delivers head-to-head fun as you battle it out to steal each others’ parts and upgrade your SPOGS Racer with new engines, tires, tailpipes and brakes. 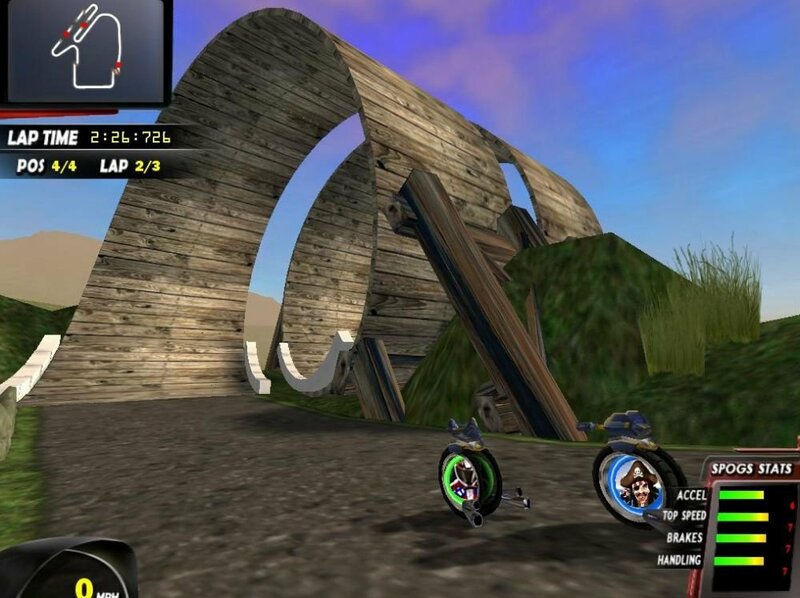 A library of game images let’s you customize and personalize your racing experience. 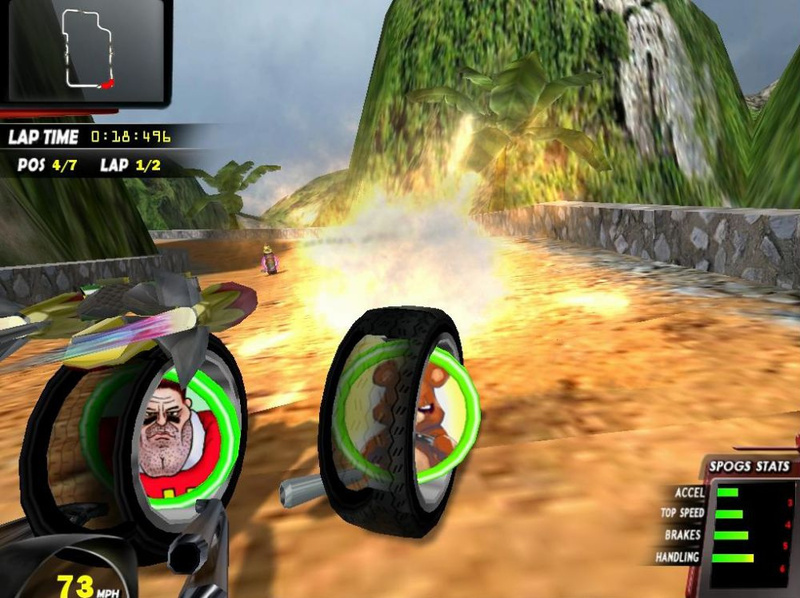 Intuitive Wiimote game controls and a robust feature set delivers the fun of arcade racing with hours upon hours of entertainment. 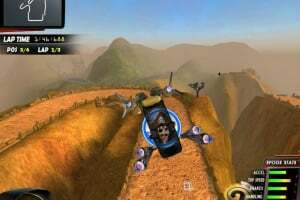 Race across 12 different tracks filled with loops, jumps, weapons and power ups. Battle it out in head-to-head split screen action. Or challenge yourself in Season Mode and race to be the best. I'am interested in seeing what this looks like. 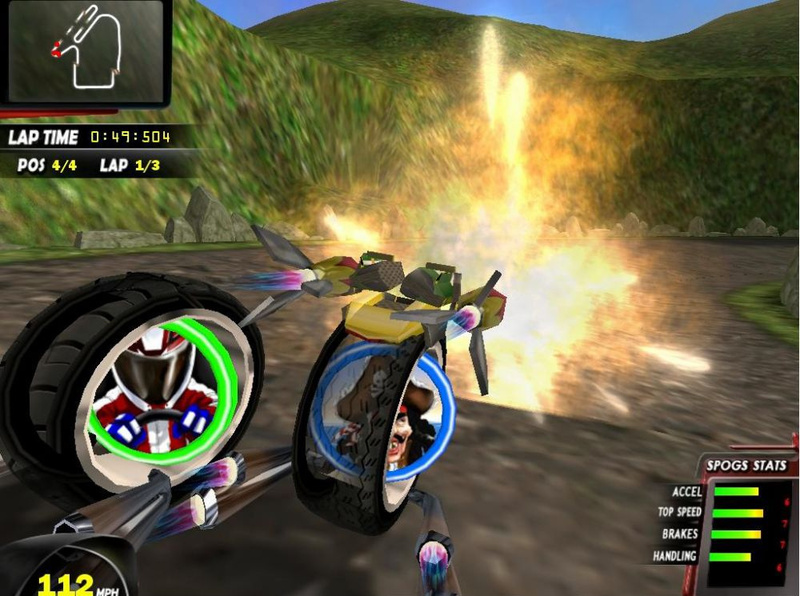 Sounds like a whacky twisted metal/Burnout type game. There is a screenshot of this in the latest Nintendo Power issue. 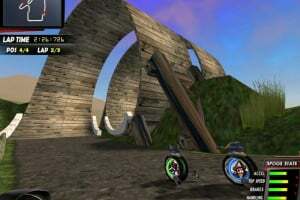 It has been reported to look like an 'early GameCube game'. For the time being, I guess you'll just have to wait for the latest Official Nintendo Magazine and skim through it. 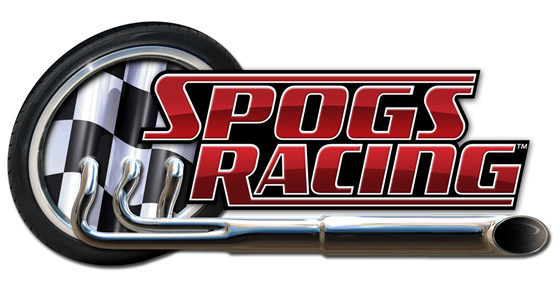 Hopefully they'll have a few new tidbits of info and a/some screenshot(s) of SPOGS Racing. Won't we get Remakes in the WiiWare world? @ZEIDO - Hopefully, though no one knows at this time. I'm hoping for some Castlevania remakes of ones that cannot make it onto the Virtual Console since it doesn't support the certain console it is on. For instance, a 3D remake of Aria of Sorrow, possibly the most popular Castlevania game and one I've not been able to play, would be awesome. Some Japanese Fire Emblem remakes wouldn't hurt, either; though they can just be translated and released with their original graphics, which is probably the case, and a case I'm good with as well. I'm more excited for some of the more original titles like LIT, LostWinds, My Life as a King, and SPOGS, more than remakes, however. I'm actually pretty interested in this. 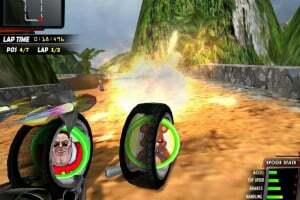 Looks like a great original game for WiiWare. I have NP and the graphics look okay when it comes to the models (though the screens are very small), but the textures look terrible. BUT, as a reviewer I cannot base a game on graphics only (and heck, it's a Wiiware game), but gameplay wise it sounds like it could be very good or be a complete failure. I guess it'll come down to balancing and controls? This game is on my wish list. I love these types of games! Maybe I will buy, but the only kind of racing games I actually like are Mario Kart and F-Zero. Would have to be very cheaper for me to buy it. It seems original, yep, and the concept is pretty good but the execution is a little lacking. And the trailer isn't that great, either. That being said, they may be able to pull things together a bit better before release but it doesn't have my eye entirely. 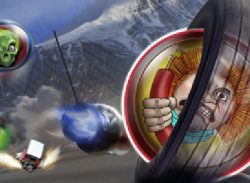 This is the WiiWare game I'm anticipating the most right now. But would make it even more awesome is if it had online. Not scoreboards, full-fledged, head-to-head online. That would be sweet! That would certainly make it better, yep. The game doesn't look "awesome" at all in my books. The concept sounds great but as I said from what I've seen, it just doesn't win me over. My problem is that this game is super laggy in the PRMOTIONAL TRAILER Come one, people, its at least gotta have a good frame rate! Looks very funny. I think I will get it when it comes out. 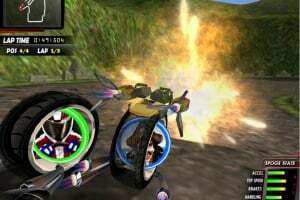 Does anybody know in which regions this game will be released? It would be too sad if it will only come out in Japan or the USA. Im the most interested in this game, looks fun. EDIT: Note to myself: dupe, just read it all! There it is, split-screen-multiplayer! I'm in! 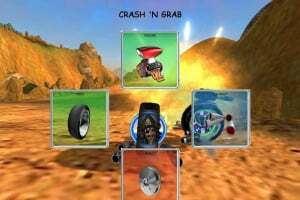 Wow, this could very well be the best party racer on the Wii, considering the only other one worth mentioning is Mario Kart Wii, which I hate with a passion(curse you blue shells, curse yoooouuuuu!!!). This is looks like an actual B grade title on WiiWare. The soundtrack it has on the vid, was rockn. I could imagine myself playn this. Then this game is a seller. Pogs FTW! This looks very interesting. Will check into it if it comes out soon! i'd be tempted to buy this game if it had online. i MIGHT still buy this game depending on what everyone thinks of it when it comes out. same here it doesn't look bad, might be fun with lots of people. it looks like it could be great actually. but it could also fail miserably. i am not sure what to think of this one. if it gets good reviews and comments, i will probably buy it. if not, then i won't buy it. Wii wheel support? I certainly hope so. I totally need a review on this one...but I'm not ruling it out just yet. Doesn't look that great imo. I'm sorry, but that music was just awful. A lot of people thoght this would be good. A lot of people were wrong. I've got to admit that this looks embarassingly bad. Some thought that itvwould be rubbish. Some people were right. I always thought it would be rubbish but now it's starting to look good. Not that I am itching to play this game or anything, but it is strange how it has made its way to the US/EU, but has not been released in AUS/NZ.